LJ 81-ZVI Normal series since 1992. Since 2017 three serial letters in the last positions in some provinces. 2008 onwards plate style. LJ = Ljubljana. Town crest = Ljubljana. LJ 81-ZVI Close-up of the above. LJ 886-SK Normal series since 1992. Since 2014 two serial letters in the last positions in some provinces. 2008 onwards plate style. LJ = Ljubljana. Town crest = Ljubljana. LJ 886-SK Close-up of the above. LJ 656-AM Normal series since 1992. Since 2014 two serial letters in the last positions in some provinces. 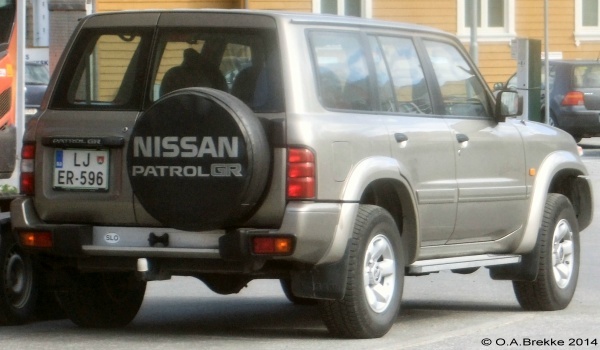 2008 onwards plate style. LJ = Ljubljana. Town crest = Ljubljana. LJ 656-AM Close-up of the above. 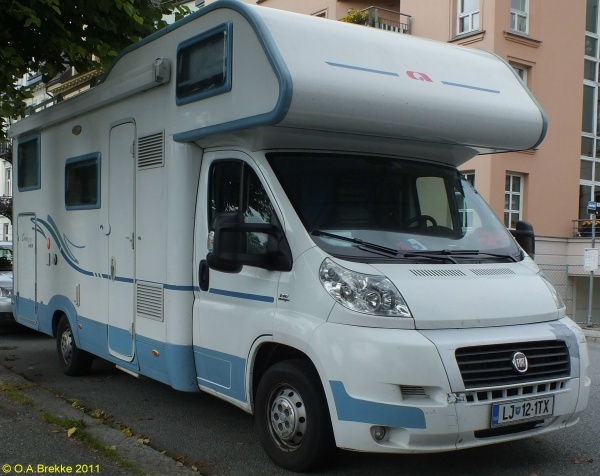 LJ 525-FR Normal series since 1992. Since 2014 two serial letters in the last positions in some provinces. 2008 onwards plate style. LJ = Ljubljana. Town crest = Ljubljana. LJ 525-FR Close-up of the above. CE HS-534 Normal series since 1992. Since 2008 two serial letters in the first positions in some provinces. 2008 onwards plate style. CE = Celje. Town crest = Celje. 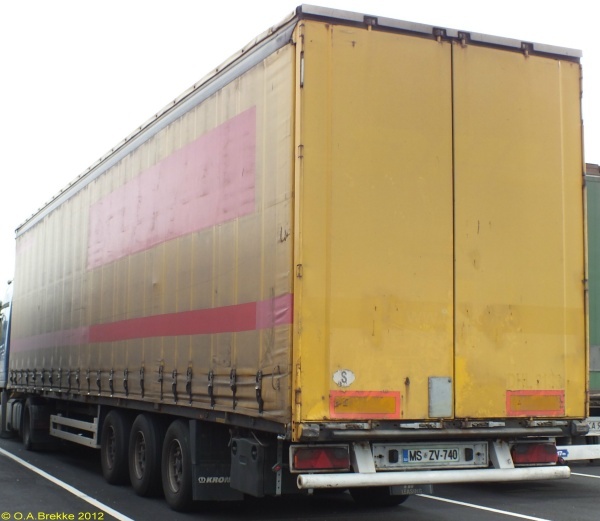 Since 2008 trailers are part of the normal series. CE HS-534 Close-up of the above. KR CR-973 Normal series since 1992. Since 2008 two serial letters in the first positions in some provinces. 2008 onwards plate style. 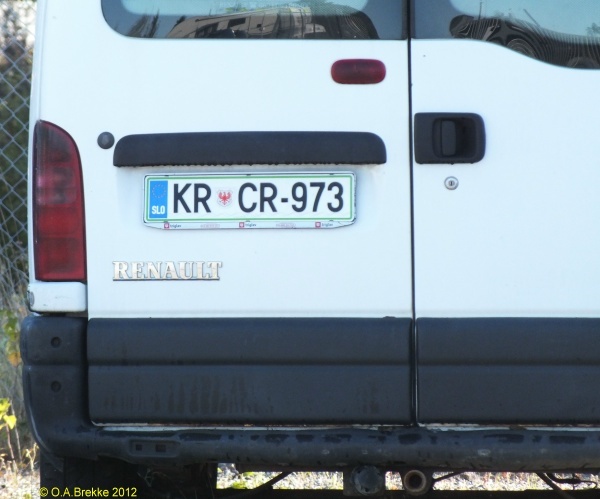 KR = Kranj. Town crest = Kranj. LJ CP-248 Normal series since 1992. Since 2008 two serial letters in the first positions in some provinces. 2008 onwards plate style. 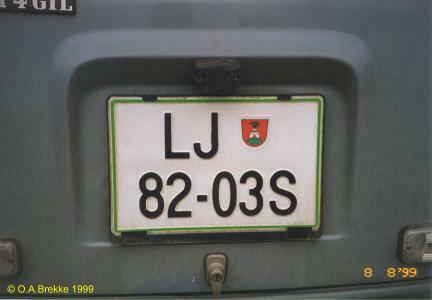 LJ = Ljubljana. Town crest = Ljubljana. LJ CP-248 Close-up of the above. LJ IM-008 Normal series since 1992. Since 2008 two serial letters in the first positions in some provinces. 2008 onwards plate style. LJ = Ljubljana. Town crest = Ljubljana. LJ IM-008 Close-up of the above. MB NL-597 Normal series since 1992. Since 2008 two serial letters in the first positions in some provinces. 2008 onwards plate style. MB = Maribor. Town crest = Maribor. 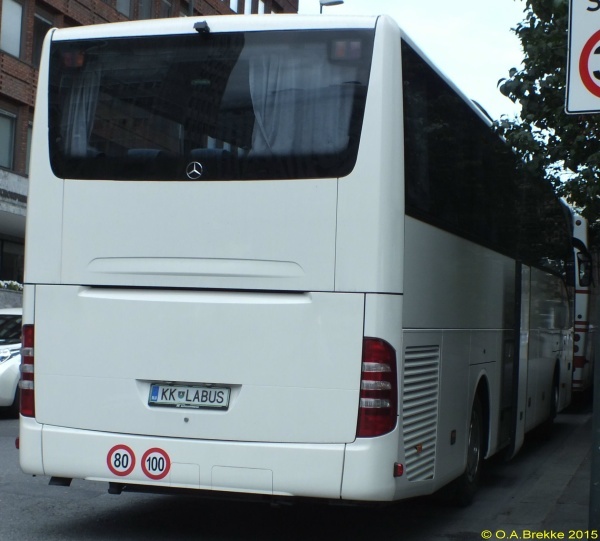 MS ZV-740 Normal series since 1992. Since 2008 two serial letters in the first positions in some provinces. 2008 onwards plate style. 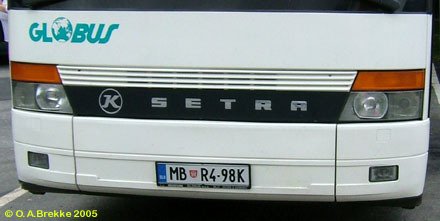 MS = Murska Sobota. Town crest = Ljutomer. 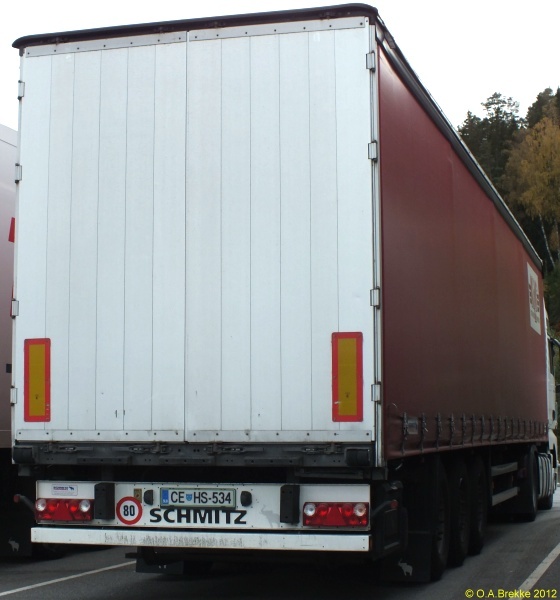 Since 2008 trailers are part of the normal series. MS ZV-740 Close-up of the above. NM MM-511 Normal series since 1992. Since 2008 two serial letters in the first positions in some provinces. 2008 onwards plate style. NM = Novo mesto. Town crest = Novo mesto. NM MM-511 Close-up of the above. LJ/ER-596 Normal series since 1992. Since 2008 two serial letters in the first positions in some provinces. 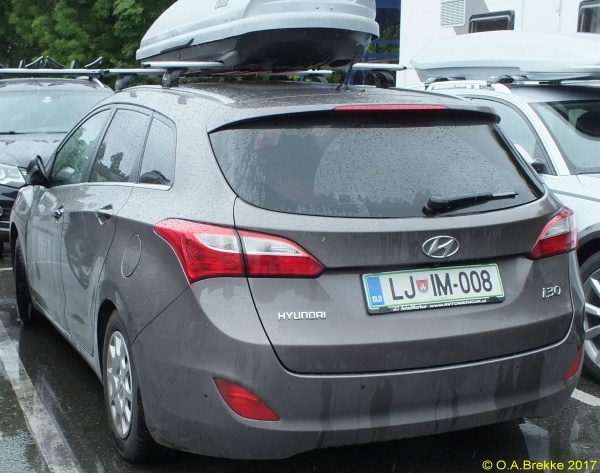 2008 onwards plate style. LJ = Ljubljana. Town crest = Ljubljana. LJ/ER-596 Close-up of the above. MB POH-1 Personalized series since 1992. 2008 onwards plate style. MB = Maribor. Town crest = Slovenska Bistrica. 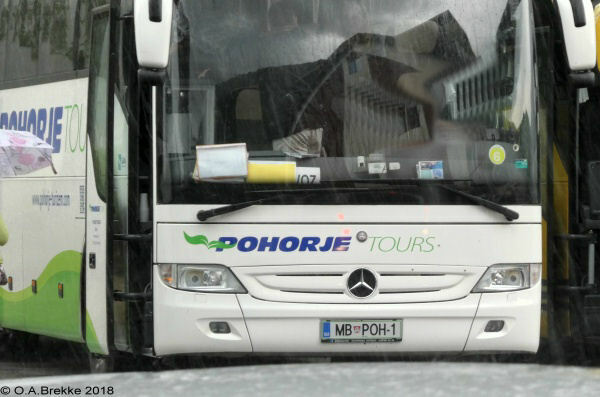 POH = Pohorje Tours. MB POH-1 Close-up of the above. MB 032R1 Personalized series since 1992. 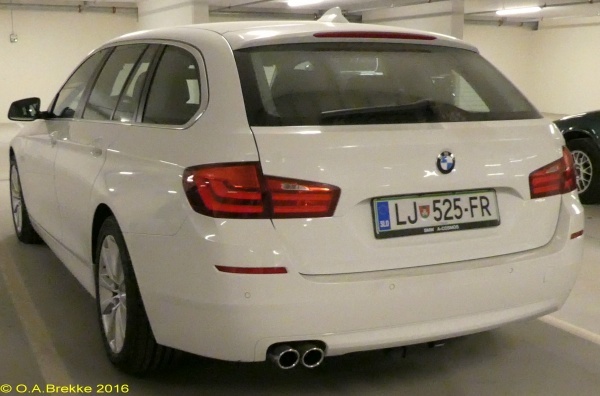 2008 onwards plate style. MB = Maribor. Town crest = Maribor. MB 032R1 Close-up of the above. KK LABUS Personalized series since 1992. 2008 onwards plate style. KK = Krsko. Town crest = Brežice. KK LABUS Close-up of the above. CE APS-66 Personalized series since 1992. 2008 onwards plate style. CE = Celje. Town crest = Velenje. CE APS-66 Close-up of the above. MB R1 032R Personalized series since 1992. 2008 onwards plate style. MB = Maribor. Town crest = Maribor. MB R1 032R Close-up of the above. 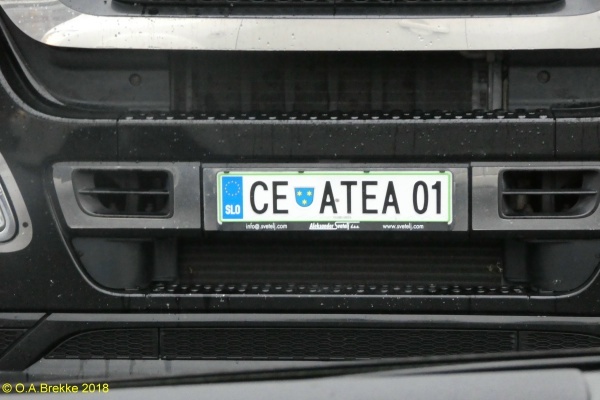 CE ATEA 01 Personalized series since 1992. 2008 onwards plate style. CE = Celje. Town crest = Celje. CE ATEA 01 Close-up of the above. LJ/82-EG Motorcycle series since 1992. Probably since 2008 two serial letters after the hyphen in some provinces. 2008 onwards plate style. LJ = Ljubljana. Town crest = Ljubljana. LJ/82-EG Close-up of the above. 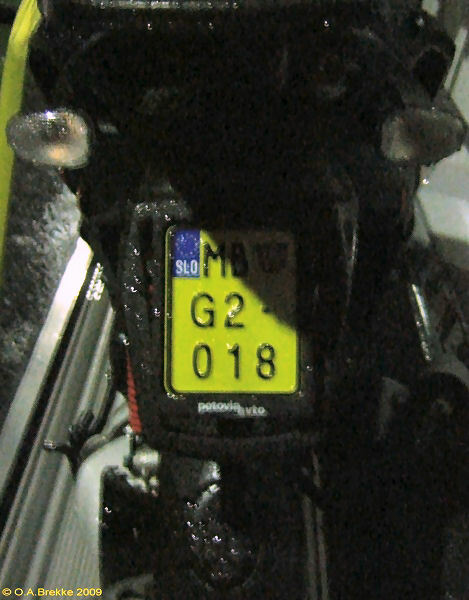 MB/G2-/018 Moped series since 2002. 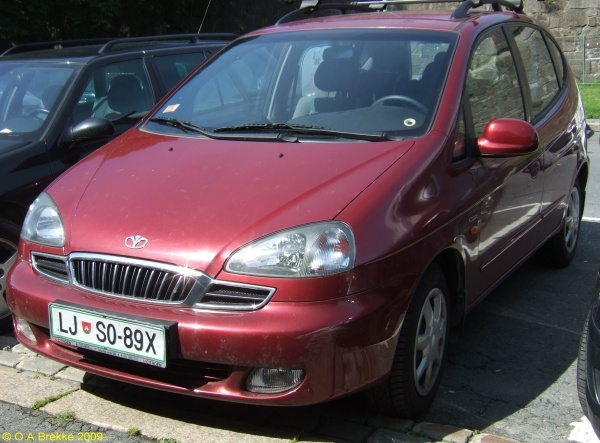 2004 onwards plate style. 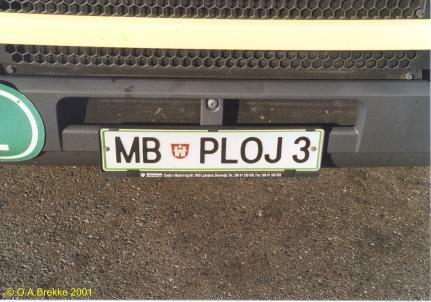 MB = Maribor. Town crest = Maribor. LJ C7-719 Normal series since 1992. 1992-2004 plate style. LJ = Ljubljana. Town crest = Ljubljana. CE/J9-071 Normal series since 1992. 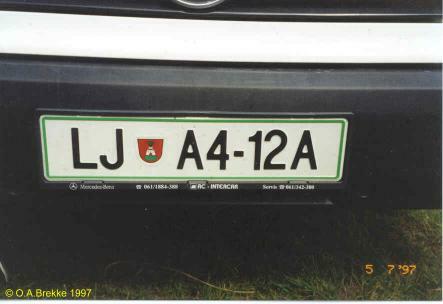 1992-2004 plate style. CE = Celje. Town crest = Velenje. 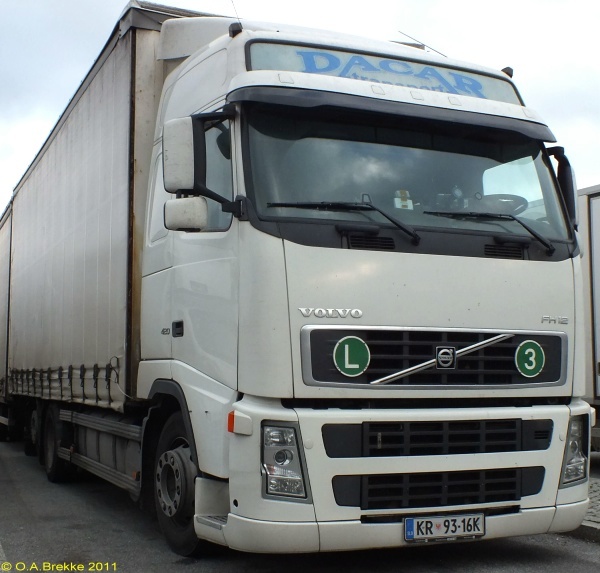 MB 25-32L Normal series since 1992. Since 1994 serial letter in the last position in some provinces. 1992-2004 plate style. MB = Maribor. Town crest = Maribor. MB 25-32L Close-up of the above. LJ 25-09A Normal series since 1992. Since 1994 serial letter in the last position in some provinces. 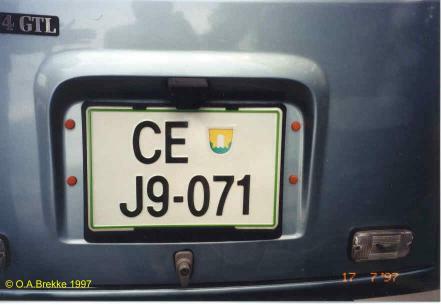 1992-2004 plate style. LJ = Ljubljana. Town crest = Ljubljana. LJ/82-03S Normal series since 1992. Since 1994 serial letter in the last position in some provinces. 1992-2004 plate style. 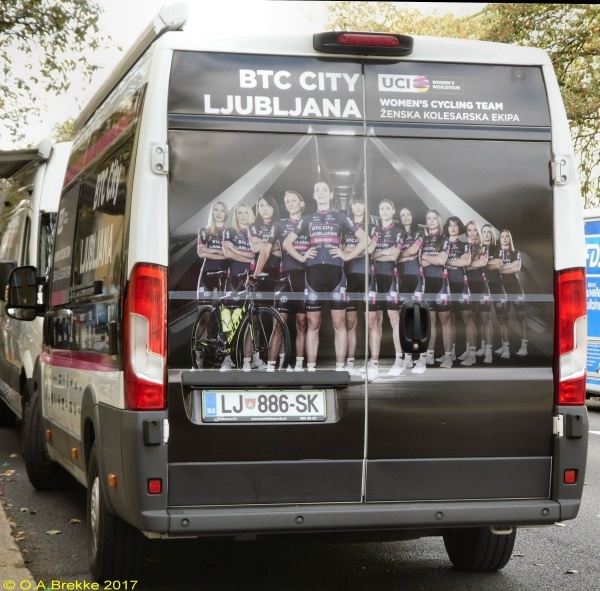 LJ = Ljubljana. Town crest = Ljubljana. LJ S0-89X Normal series since 1992. Since 1997 serial letters in the first and last positions in some provinces. 1992-2004 plate style. LJ = Ljubljana. Town crest = Ljubljana. LJ S0-89X Close-up of the above. LJ A4-12A Normal series since 1992. Since 1997 serial letters in the first and last positions in some provinces. 1992-2004 plate style. LJ = Ljubljana. Town crest = Ljubljana. 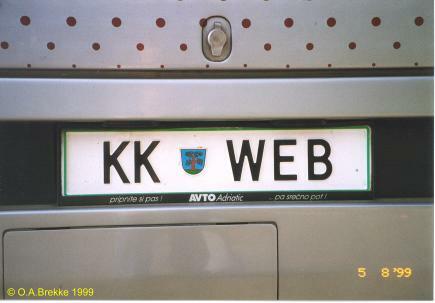 KK WEB Personalized series since 1992. 1992-2004 plate style. KK = Krško. Town crest = Sevnica. MB BRM 4 Personalized series since 1992. 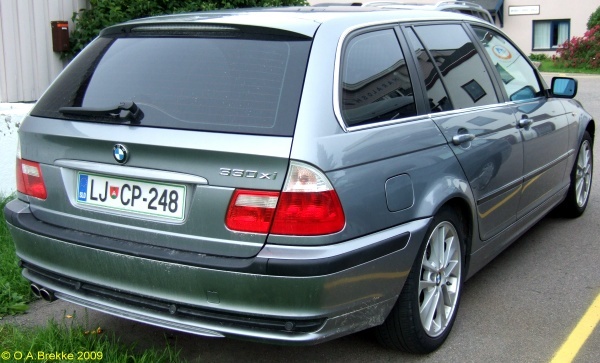 1992-2004 plate style. MB = Maribor. Town crest = Maribor. 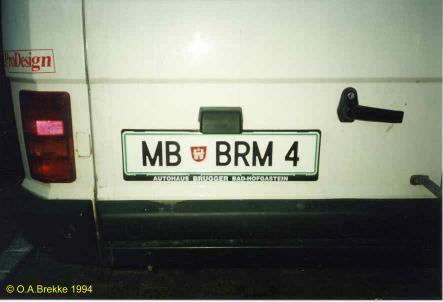 The personalized part: BRM = Branik Maribor (a ski/ sports club). 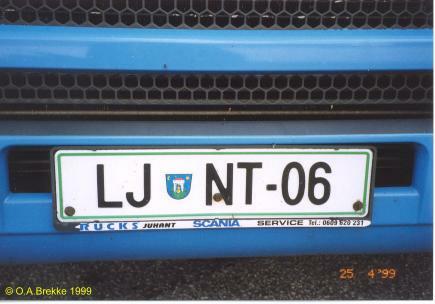 LJ NT-06 Personalized series since 1992. 1992-2004 plate style. 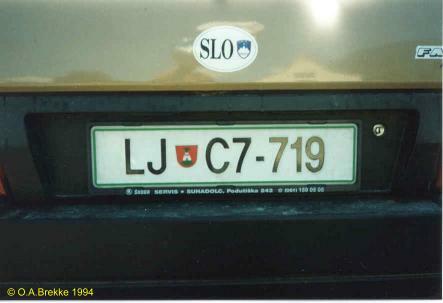 LJ = Ljubljana. Town crest = Kamnik. 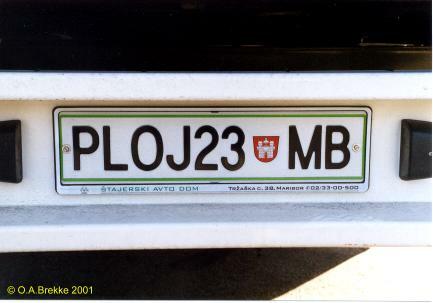 MB PLOJ 3 Personalized series since 1992. 1992-2004 plate style. 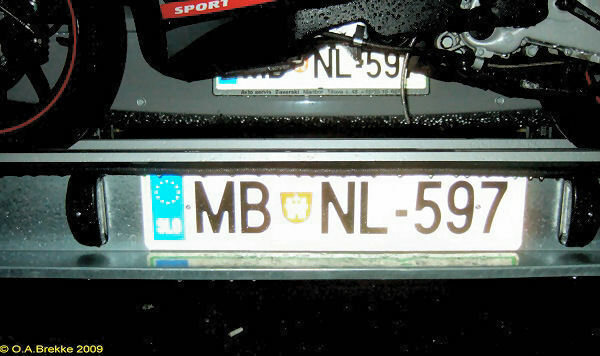 MB = Maribor. Town crest = Maribor. 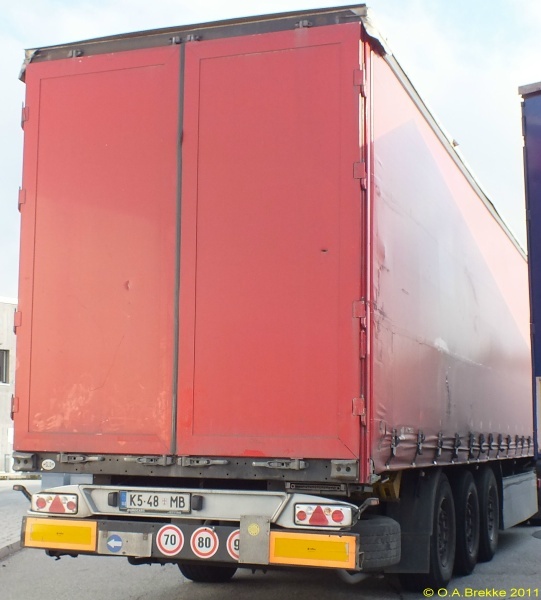 PLOJ is the name of the trucking company. CE APM-12 Personalized series since 1992. 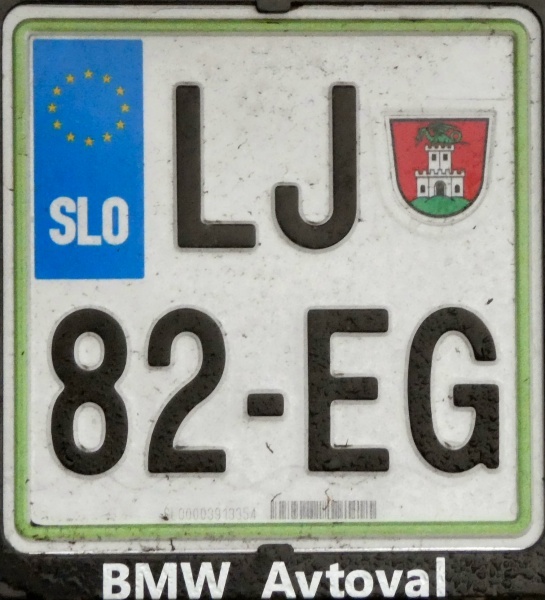 1992-2004 plate style. CE = Celje. Town crest = Žalec (old crest). 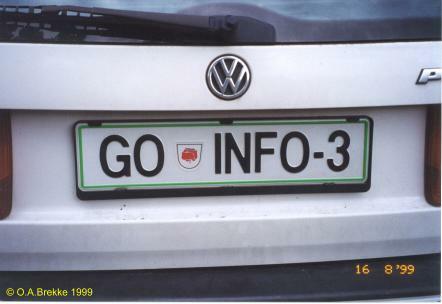 GO INFO-3 Personalized series since 1992. 1992-2004 plate style. GO = Nova Gorica. Town crest = Nova Gorica. 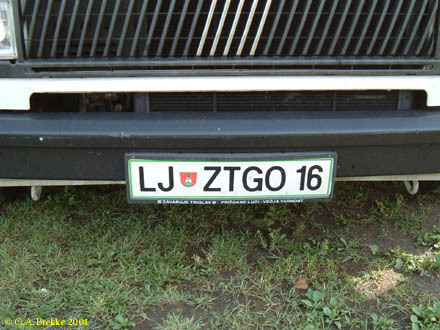 LJ ZTGO 16 Personalized series since 1992. 1992-2004 plate style. 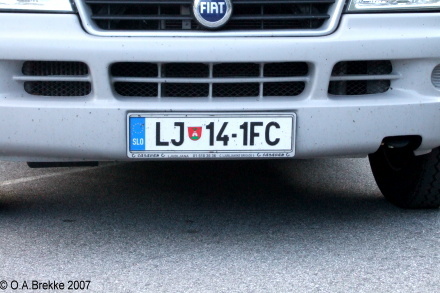 LJ = Ljubljana. Town crest = Ljubljana. 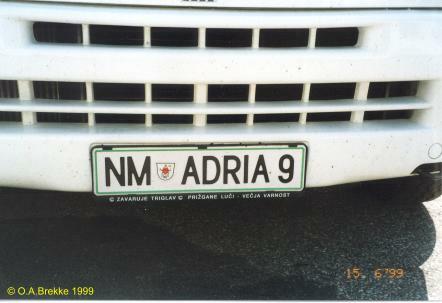 NM ADRIA 9 Personalized series since 1992. 1992-2004 plate style. NM = Novo mesto. Town crest = Novo mesto. 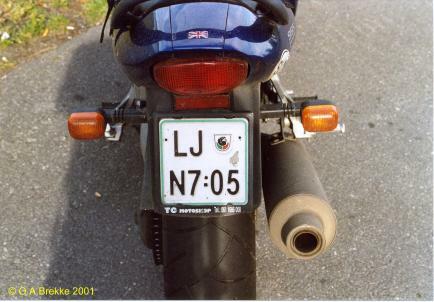 LJ/N7-05 Motorcycle series since 1992. 1992-2004 plate style. LJ = Ljubljana. Town crest = Grosuplje. 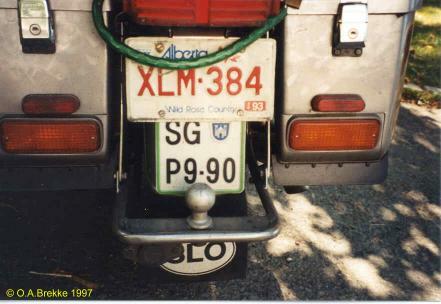 SG/P9-90 Motorcycle series since 1992. 1992-2004 plate style. SG = Slovenj Gradec. Town crest = Slovenj Gradec. Also displayed an Alberta plate. 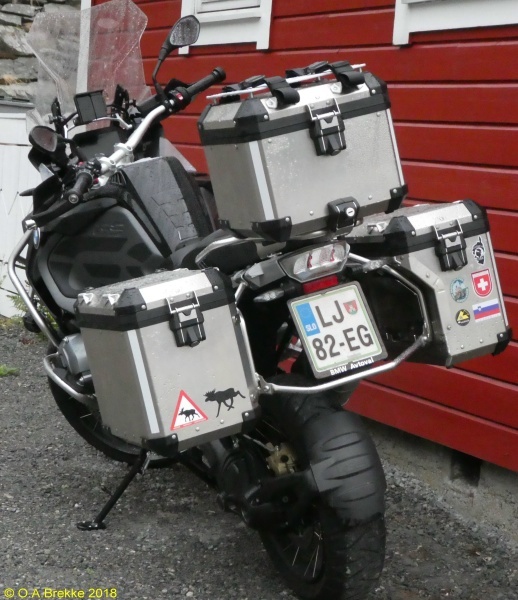 The rider told me he had imported the bike from Canada, and no one demanded he should remove the Alberta plate. 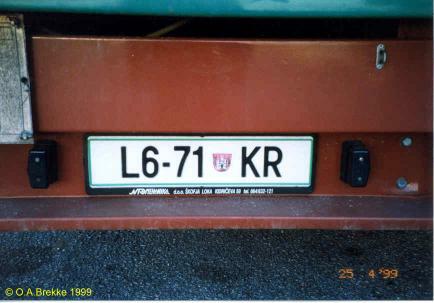 L6-71 KR Trailer series since 1992. 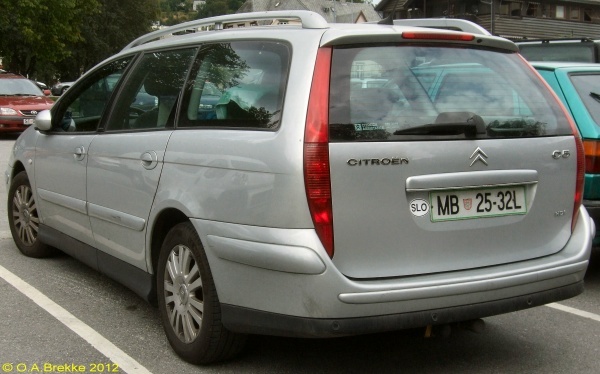 1992-2004 plate style. 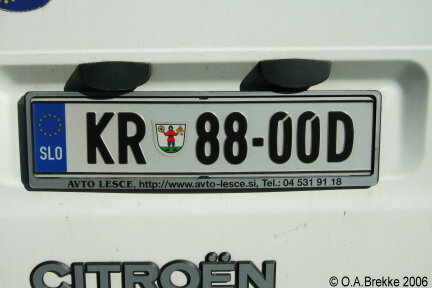 KR = Kranj. Town crest = Škofja Loka. 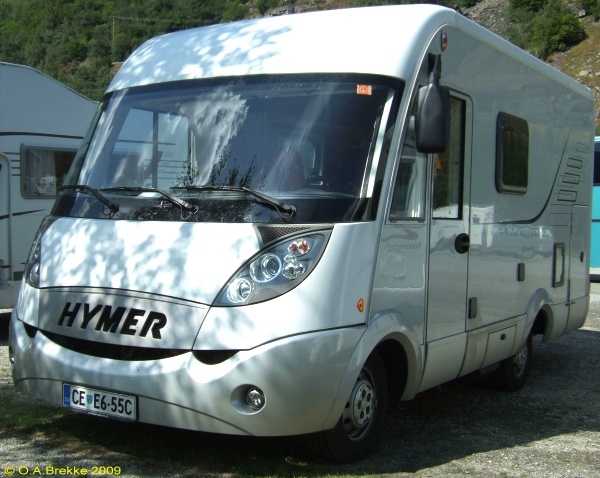 06-NT LJ Personalized trailer series since 1992. 1992-2004 plate style. LJ = Ljubljana. Town crest = Kamnik. 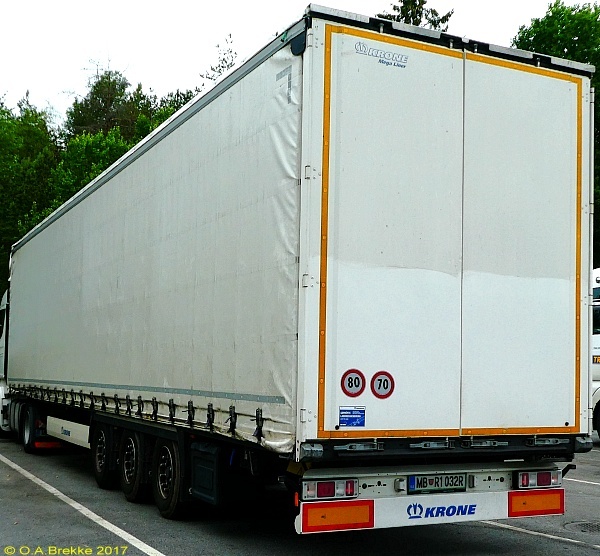 This is the trailer of LJ NT-06 above. 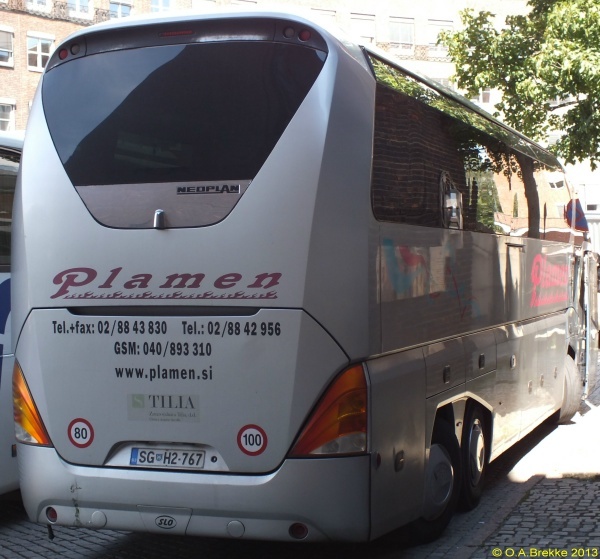 PLOJ23 MB Personalized trailer series since 1992. 1992-2004 plate style. MB = Maribor. Town crest = Maribor. 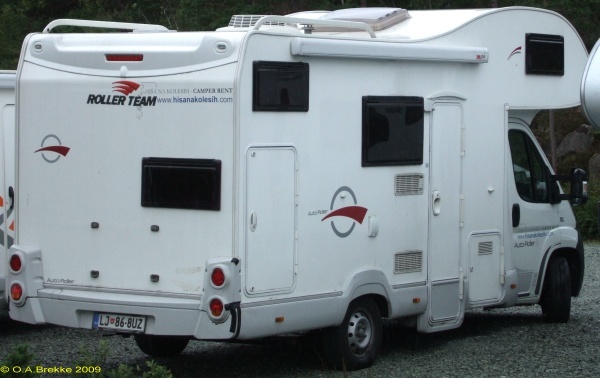 This is the trailer of MB PLOJ 3 above. 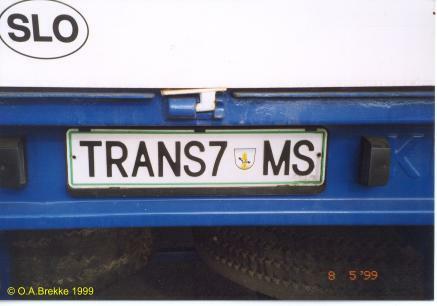 TRANS7 MS Personalized trailer series since 1992. 1992-2004 plate style. MS = Murska Sobota. Town crest = Murska Sobota (old crest). 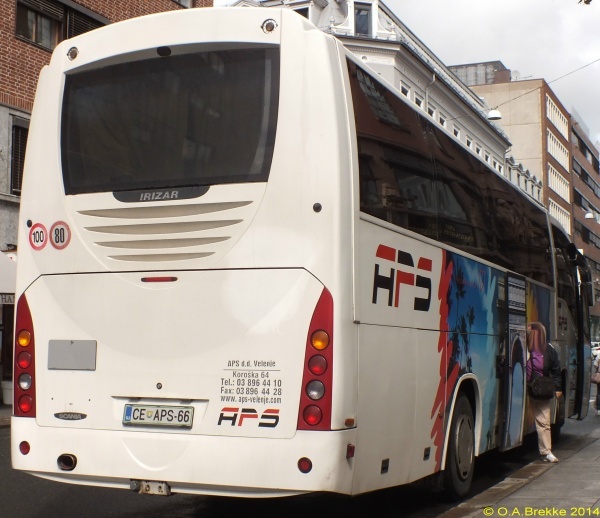 SG H2-767 Normal series since 1992. 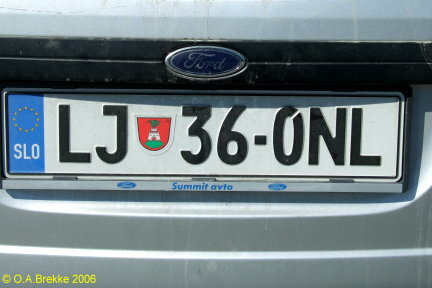 2004-08 plate style. SG = Slovenj Gradec. Town crest = Slovenj Gradec. SG H2-767 Close-up of the above. CE U8-499 Normal series since 1992. 2004-08 plate style. CE = Celje. Town crest = Celje. GO N1-047 Normal series since 1992. 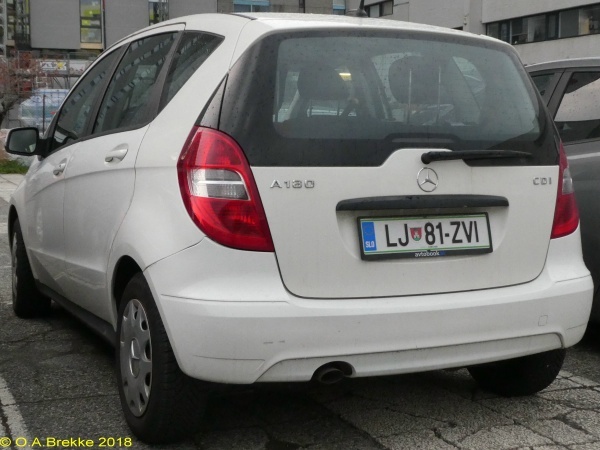 2004-08 plate style. 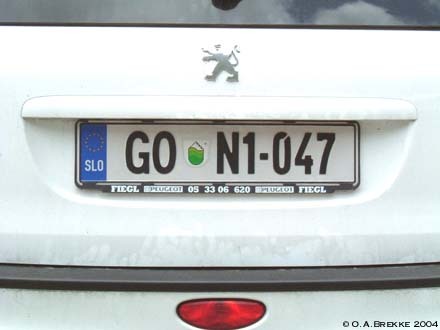 GO = Nova Gorica. Town crest = Ajdovščina. KR 93-16K Normal series since 1992. Since 1994 serial letter in the last position in some provinces. 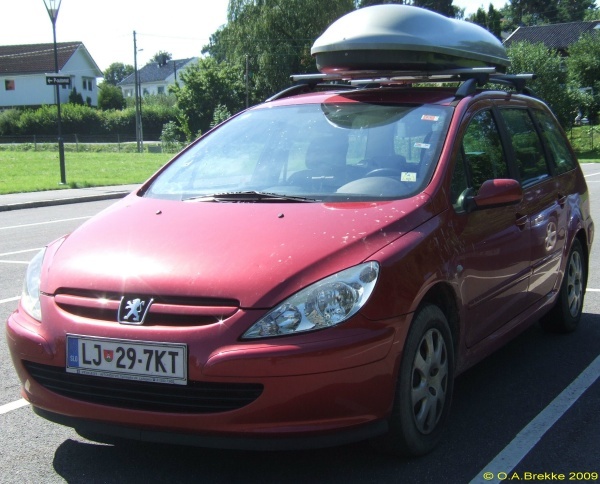 2004-08 plate style. KR = Kranj. Town crest = Kranj. KR 93-16K Close-up of the above. 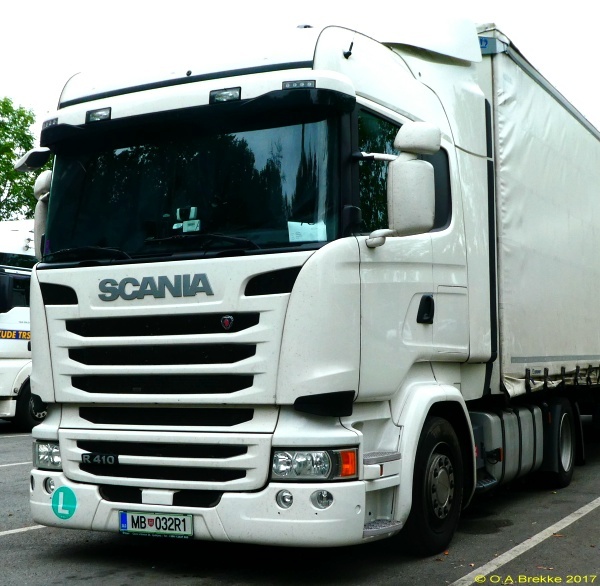 KR 88-00D Normal series since 1992. Since 1994 serial letter in the last position in some provinces. 2004-08 plate style. KR = Kranj. Town crest = Radovljica. CE E6-55C Normal series since 1992. Since 1997 serial letters in the first and last positions in some provinces. 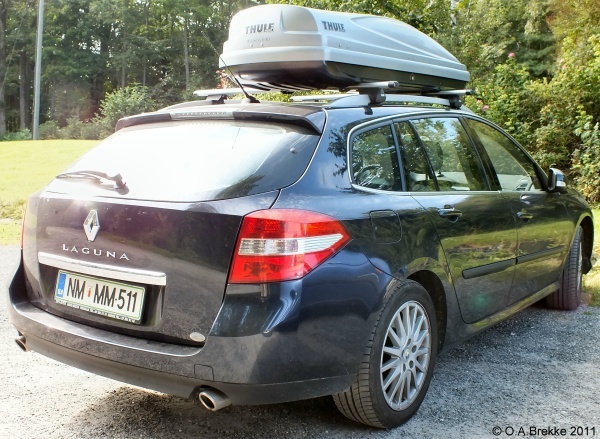 2004-08 plate style. 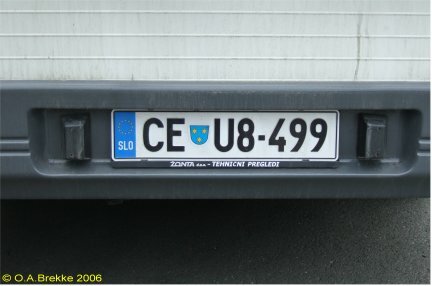 CE = Celje. Town crest = Celje. CE E6-55C Close-up of the above. 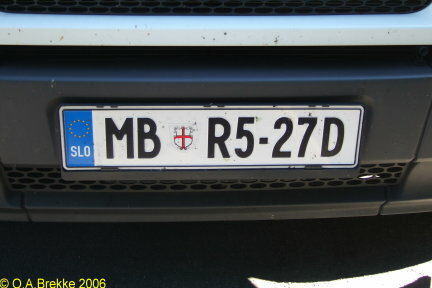 MB R5-27D Normal series since 1992. Since 1997 serial letters in the first and last positions in some provinces. 2004-08 plate style. MB = Maribor. Town crest = Ptuj. MB R4-98K Normal series since 1992. Since 1997 serial letters in the first and last positions in some provinces. 2004-08 plate style. MB = Maribor. Town crest = Maribor. LJ 12-1TX Normal series since 1992. Since 2005 two serial letters in the last positions in some provinces. 2004-08 plate style. LJ = Ljubljana. Town crest = Kamnik. LJ 12-1TX Close-up of the above. LJ 14-1FC Normal series since 1992. Since 2005 two serial letters in the last positions in some provinces. 2004-08 plate style. LJ = Ljubljana. Town crest = Ljubljana. LJ 29-7KT Normal series since 1992. Since 2005 two serial letters in the last positions in some provinces. 2004-08 plate style. LJ = Ljubljana. Town crest = Ljubljana. LJ 29-7KT Close-up of the above. LJ 36-0NL Normal series since 1992. Since 2005 two serial letters in the last positions in some provinces. 2004-08 plate style. LJ = Ljubljana. Town crest = Ljubljana. LJ 86-8UZ Normal series since 1992. Since 2005 two serial letters in the last positions in some provinces. 2004-08 plate style. LJ = Ljubljana. Town crest = Ljubljana. LJ 86-8UZ Close-up of the above. 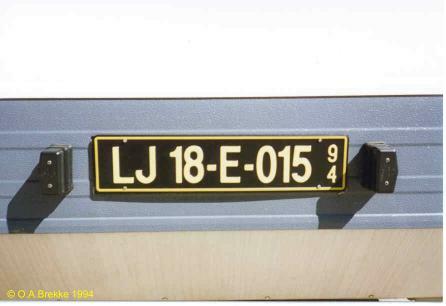 LJ RTV 442 Personalized series since 1992. 2004-08 plate style. LJ = Ljubljana. Town crest = Ljubljana. RTV = Radiotelevizija. LJ RTV 442 Close-up of the above. K5-48 MB Trailer series since 1992. 2004-08 plate style. MB = Maribor. Town crest = Ptuj. K5-48 MB Close-up of the above. R1-01 KR Trailer series since 1992. 2004-08 plate style. 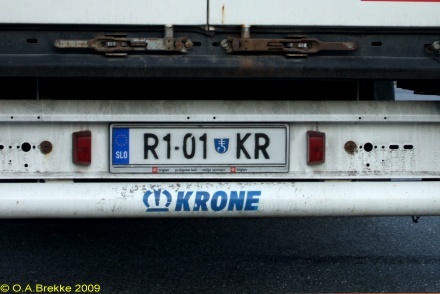 KR = Kranj. Town crest = Jesenice. 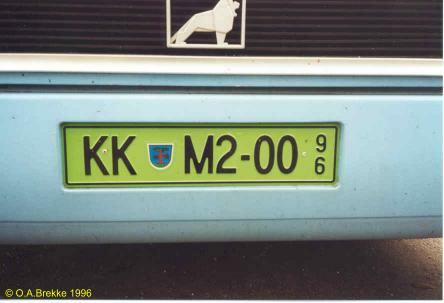 KK M2-00 Temporary series since 1992. 1992-2004 plate style. KK = Krško. Town crest = Sevnica. Valid until end of 1996. LJ 18-E-015 Foreign residents series 1992-96. 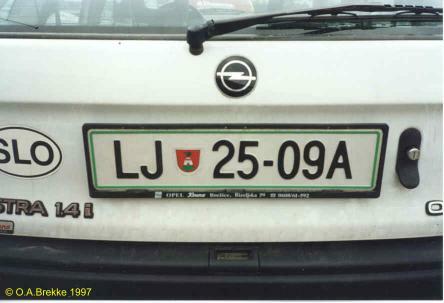 LJ =Ljubljana. 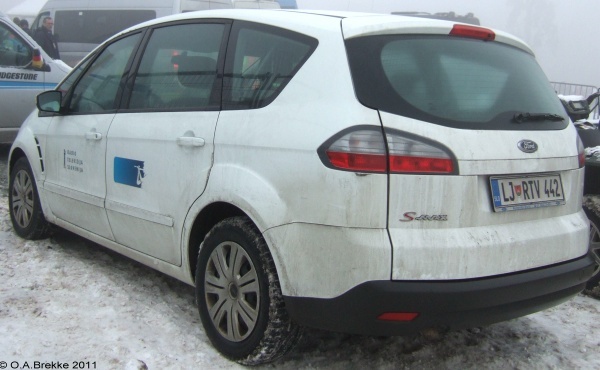 E = Foreign business owned vehicles and their employees. 18 = Switzerland. Valid in 1994. 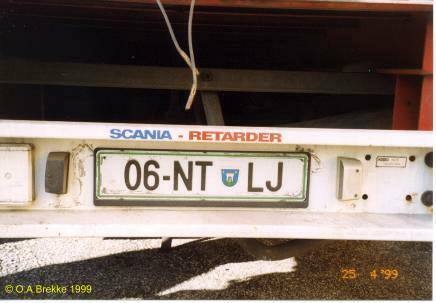 This plate was on a caravan that displayed the same registration as the prime mover.